An ObamaCare supporter sees successes and areas for improvement from the third open enrollment period, but not everyone agrees. Anne Filipic, president of Enroll America, writes that four million new Americans enrolled for health insurance through the Affordable Care Act's marketplaces; that last year's new consumers have become this year's "savvy re-enrollees"; and that the outreach and enrollment coalition "has never been stronger." Hadley Heath Manning, director of health policy at the Independent Women's Forum, spoke with OneNewsNow about Filipic's touting of the "successes" of ObamaCare – beginning with the number of enrollees. "[That's] not necessarily a metric that tells us how successful or unsuccessful the law has been," says Manning. "... It tells us nothing about the affordability of those plans for the people who are enrolled in them, and it tells us nothing about how satisfactory consumers find those plans." Manning also points out the law mandates that everyone purchase health insurance. 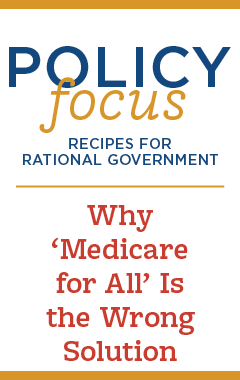 "So it's hard to determine how much of this demand is based on interest, [how much is] based on people who find these coverage options attractive, and how much of it's based on a responsibility or a desire to avoid the individual mandate and the associated penalty," she says. When it comes to ways for future open enrollment periods to improve, Filipic suggests the government and supporters of the ACA "fill in stubborn knowledge gaps by continuing to invest in outreach and education." On that note, however, Manning says it's amazing that there would be knowledge gaps that persist today. "When something has been a law for six years, especially in the information age that we live in, it's hard to believe that there are serious knowledge gaps when it comes to outreach and education," she remarks. Meanwhile, Filipic recommends doubling down on making it easier for people to choose the best plan for their needs. For example, Filipic says that going into open enrollment two (OE2), almost half of the uninsured said they were not confident they could pick the right kind of coverage for themselves. "That's why, for OE3, we launched the Get Covered Plan Explorer," writes Filipic. "[It's] a digital tool that lets people compare estimates of how much each plan would cost in a year, and which doctors would be covered." Manning thinks it was definitely an improvement that they're offering consumers more information up front, but she still urges those in charge of enrollment to offer people information about the unsubsidized price that these plans cost and the subsidized price. "Of course, another challenge in terms of cost for many consumers on the ACA exchanges – especially subsidized consumers who are middle- to low-income – is that if they're not aware upfront about their out-of-pocket responsibilities, then they can end up with a lot of health insurance bills throughout the year not realizing that the health insurance plan they purchased through the ACA doesn't cover everything," says Manning. Speaking of cost, Filipic wants government and enrollment officials to focus on making financial help "feel real" to people who had not been able to afford health insurance before the Affordable Care Act took effect. Manning sees a few things wrong with this approach. "I can understand why, even for those receiving financial help, it doesn't 'feel real' because of the way the law is structured and how very expensive these plans are compared to plans that might be more bare bones or that might have existed before the ACA," she offers. "Secondly, this matter about whether or not people who are uninsured today know that they are eligible for subsidies and tax credits – this is a two-sided coin."